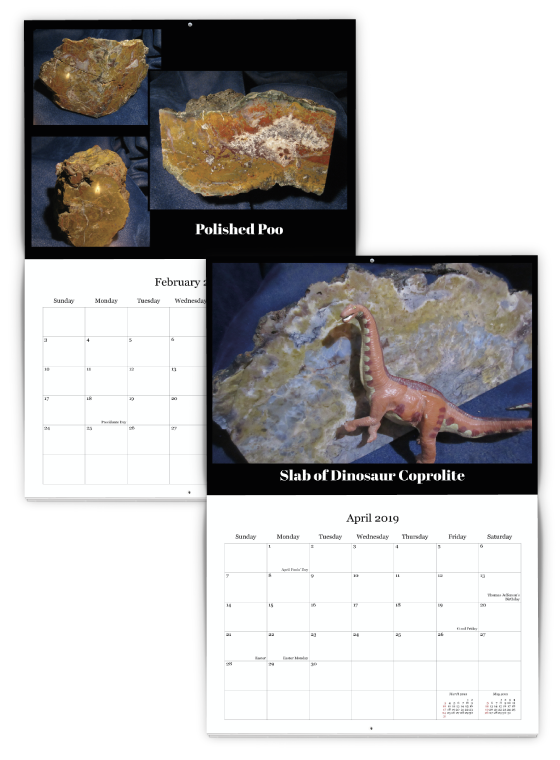 When David Freitag’s Dinosaur Coprolite 2019 Calendar came across my desk, I was immediately interested and had to call him to get more information on these dinosaur nugget calendars. 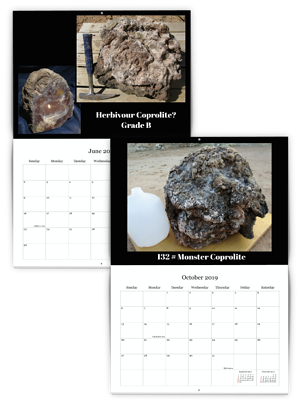 David created his Coprolite Calendar because he didn’t have a calendar at the time. What he did have were hundreds of photos that were taken for his eBay Rock Store, which he started 5 years ago. David used to gold mine for over 15 years in Wyoming out in the desert. He wrote the story, “Wyoming’s Billion Dollar Nugget,” which was published by the California Mining Journal many years ago. “After we reclaimed our gold mining site, I was tired of gold and wanted to hunt fossils again,” says Freitag. 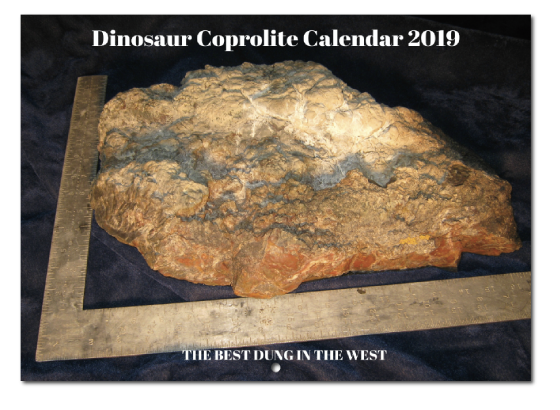 In doing so, he found huge deposits of Dinosaur Coprolite along with Dinosaur Gizzard Stones and other dinosaur relics. “After some time went by, I was sitting in my easy chair one night, just about to drift off, when I heard Rick from Pawn Stars on the TV. He said, ‘You know, in the 25 years since I’ve been a pawn broker, about the only thing I haven’t seen come across the counter is dinosaur poop.’” “Well,” thought Freitag, “I have 3 pallets out back with some of the finest dinosaur poo you can buy.” After doing a web search and contacting the show, 5 months later he was in Las Vegas filming his sale of Coprolite on Pawn Stars. 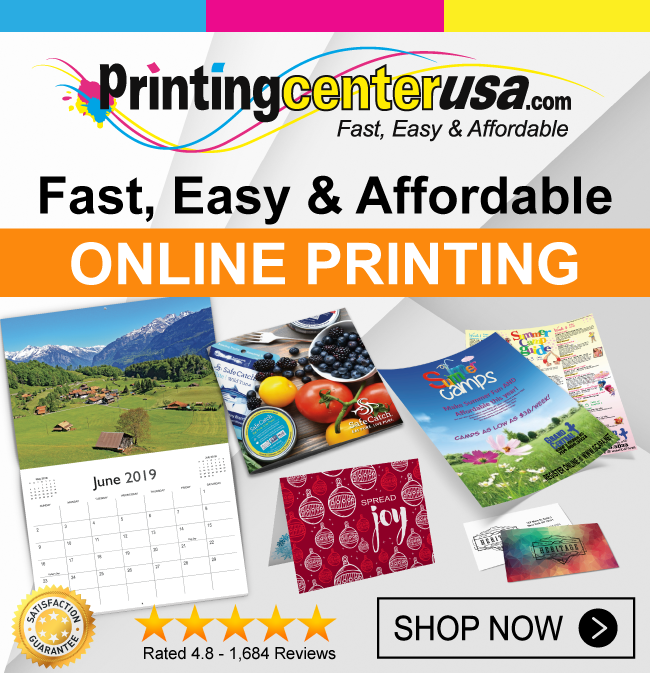 Rick bought the piece featured on the 2019 calendar’s cover for $1,100! Shortly after being featured on the show, David heard a Jade collection was for sale and bought 6 pickup trucks full of the gemstone. He then began his rock store on eBay and it has grown very nicely.